If you forgot to pull your turkey out of the freezer or it hasn't thawed as fast as you thought it would, all is not lost. You can safely cook a frozen turkey with great results. You'll just need to budget more time for the task because it'll take about 50% longer to cook. And you'll need to cook your turkey in the oven. Frozen turkeys shouldn't be grilled, smoked, deep-fried or microwaved because they won't cook evenly enough to guarantee a safe temperature. Preheat your oven to 165 degrees. Then, unwrap your turkey, and place it in a roasting pan. Don't worry about removing the giblet bag or neck at this point -- they'll be difficult to pull out of a frozen bird. Place your turkey in the oven, and cook for a few hours. 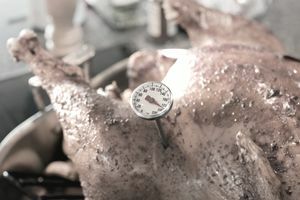 Then, use a meat thermometer to check the temperature of the innermost portion on the thighs and wings. When they reach 150-160 degrees, the turkey should be thawed enough for you to remove the giblet bag and neck. Don't leave the bag in any longer than you have to because it could melt and ruin your turkey. Continue cooking until the thickest part of the breast reaches 165 degrees. The thighs and wings will get there a lot sooner. You can wrap them in foil to protect them from burning, while you're waiting for the breasts to reach temperature. Note: Cooking times will vary from oven to oven and bird to bird. Always use a meat thermometer to determine when your turkey is done. *All recommendations are based on current USDA guidelines.